﻿This is a photo of a cloth doll pattern from my favourite doll patterns book Making Cloth Dolls edited by Dorothea Hall. I really like this book as it gives you some basic ideas which you can develop, or simply follow theirs. 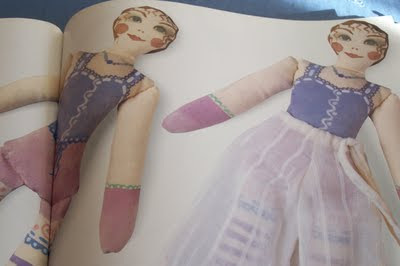 In the book, they have painted the clothes, shoes and face of the doll with watered down acrylic paints, but I am going to try almost full strength teal coloured paint for the shoes, and then probably water it down a bit for the garments and face. 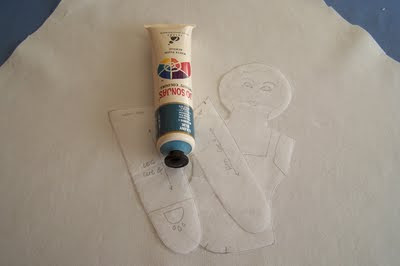 I am not sure yet, but will try out some ideas on a piece of scrap fabric before I work on the doll. I am making 2 dolls so I can try out more than one idea if I want to. They are very small; only 27cm/10.5 inches high. I am using some calico that I used for a toile or test of a jacket I made a couple of years ago. I washed the calico to make sure that there were no residue chemicals in the fabric as I want to make sure the paints adhere to the fabric properly.